Crouched near a mound of rocks and dirt, Ramón swings a short-handled pick at a shallow hole, showing off the technique he uses to mine what he calls “black pebbles” — stones laced with minerals important to high-tech manufacturers worldwide. Over the last couple of years Ramón has labored at small, out-of-the-way mines, walking up to a week to reach claims he’s staked out deep in southwest Venezuela’s Amazon jungle, near the country’s border with Colombia. It’s worth the backaches and sweat, Ramón said, rolling a near-black rock in the palm of his hand. He said he earns good money supplying brokers with stones that hold coltan ore. Applied to microchips, the metal enables electronic capacitors to perform superbly in an array of devices, like smart phones in the pockets of more and more consumers. Refined into a powder and applied to solar panels, coltan increases energy efficiency. And as a strategic mineral, Coltan carries weight because it allows guidance controls in smart bombs to work in extreme climate conditions. Because of that, Venezuelan coltan has raised concerns in Washington, D.C., as the government of President Hugo Chávez has selected Iranian, Chinese and Russian firms to explore minerals and is looking to develop future supplies of different ores. Today it is illegal to mine coltan in Venezuela. But thanks to the likes of Ramón, Venezuelan coltan is already coming on to the international minerals market — as black-market contraband. In government documents in several countries, police and military reports and interviews with miners and residents in South America’s northern Amazon jungles, the International Consortium of Investigative Journalists found a robust, illicit trade in coltan and growing risk for small-scale miners chasing ore.
Children, women and vulnerable native Indians are exposed to dangerous work conditions, drug smugglers and armed gangs that have been smuggling ore. Illicit Venezuelan coltan, experts said, is likely being mixed with legitimate minerals in smelters around the world, and then sent to high-tech manufacturers. There is concern that while there’s a regulatory vacuum in Venezuela — there are no rules, even for miners who want to legitimately mine coltan — it will be difficult to keep illicit coltan out of the global minerals supply stream. “Venezuela could emerge as a big problem because it represents another source of conflict coltan, coming from an area where there is no regulation, no transparency and no security for the people working in the mines,” said Aaron Hall, an analyst with the Washington, D.C.-based Enough Project. This means that consumer-driven demand for everyday electronics may be supporting criminal gangs and organized crime in an illicit market for valuable minerals in South America. In Colombia, for example, police recently confiscated 83 tons of coltan and other minerals from an operation reportedly run by smugglers who, according to U.S. law enforcement officials, also supply cocaine to Mexico’s powerful Sinaloa drug cartel. Much of coltan territory in Venezuela hugs the border with Colombia — an area of inaccessible jungle and meandering rivers and streams — where armed paramilitaries and drug smugglers for years have been recognized as powerful forces. Cross-border violence is on the rise in the area, turning the zone into a flashpoint in an increasingly tense relationship between the anti-American Chávez and the pro-U.S. government of Colombia. This is why American national security experts have noted the proliferation of black-market coltan, while Chávez plans the future coltan trade with the help of Iran. The Iranian government is assisting in soil and mineral studies and the mapping of mining regions. Sadra, an Iranian-government-owned industrial company, operates a Latin American subsidiary and maintains an office in Caracas. In 2010 it participated in a conference in Venezuela to show Iran’s capabilities in the country and hosted a meeting of local and Iranian diplomats and government officials, including José Salamat Khan, Venezuela’s mining minister. Later, Khan confirmed that Venezuela was working with Iranian mining experts. “We decided to work with the Iranian brothers in the exploration of mines in Bolívar State,” Khan said. Sadra’s parent company, Khatam al-Anbiya, is on the U.S. Treasury Department’s list of entities subject to sanctions because of Iran’s nuclear programs. China, which uses most of the world’s coltan supply, recently pledged mining-industry support to Chávez and to Brazil, one of the biggest exporters of processed coltan. In the fall of 2009, President Hugo Chávez announced the “discovery” of huge coltan reserves in Venezuela’s Amazon jungle. Chávez’s proclamation came despite coltan’s long existence on a list of valuable elements known to rest in abundance in Venezuela. For a time one company was even allowed to legally prospect for coltan. Nonetheless, Chávez outlawed private mining and launched “Operation Blue Gold”: 15,000 troops deployed to pursue smugglers he said were sneaking ore into Colombia. The action heightened tensions between the two countries in an area where cross-border violence was already on the rise. Since Chávez’s announcement, however, Venezuela’s Amazon military patrols have failed to stop coltan smuggling and the government has been silent on new rules for prospectors. “Colombia or Brazil get this big business because the exploitation of minerals is official there, or at least is not illegal,” Liborio Guarulla, governor of Venezuela’s Amazonas state, told ICIJ. Venezuelan mining officials declined requests from ICIJ to talk about coltan. Other factors have made it easy for black-market coltan to flourish: In the global coltan trade there is no public commodity price index. Most deals are shrouded in secrecy. Coltan is a composite of metals — primarily columbite and tantalite — and moves through the supply chain as tantalum or niobium. “Tantalum and niobium materials are not openly traded. Purchase contracts are confidential between buyer and seller,” notes a USGS advisory. Still, some analysts have reviewed industry statistics and established that in the high-quality coltan sector, about a fifth of the $150 million-a-year global marketplace comes from black-market sources in conflict zones, mostly in Central Africa. Smugglers there sneak coltan from the Democratic Republic of Congo to Rwanda, where it is relabeled and sold to the global market. Central Africa, Brazil and Australia are the world’s leading suppliers of coltan. The metal’s pivotal role in high-tech manufacturing became clear in 2001, when Sony delayed the rollout of new video game players because of a shortage of coltan. Prices at the time reached an estimated $300 a pound. Since 2007 the growing smart phone market has fueled more mining of high-quality coltan, at an estimated rate of 3 million pounds per year. About 1.1 million pounds each year are used by U.S. manufacturers who apply it to high-tech microchips and to an array of other products, from industrial turbines to synthetic hip replacements. The coltan price has been on a rollercoaster since the 2001 shortage, due mainly to ramped up production in Central Africa, a decision by the U.S. in 2007 to unload its reserves on the open market, and the shuttering of one of the world’s biggest mines, in Australia. With more coltan on the market today, the overall price for high-quality material has hovered around $50 a pound of late. Today coltan from Central Africa mostly feeds a global spot market that manufacturers tap when long-term contracts with legitimate suppliers are not enough. The spot-market supply has grown in recent years. But because minerals and metals from different sources are routinely mixed in spot-market supply lines, analysts say it’s almost impossible to tell good coltan from the bad. Today there is no accurate test of origin for coltan ore — geo-fingerprinting — like there is for diamonds. One pilot study in Germany is exploring a geo-fingerprint for coltan, measuring mineral concentrations, soil type and radiation levels surrounding an ore sample, to identify the ground where it was pulled from. And there’s talk of applying pressure on producers via the U.S. government’s Dodd-Frank Act of 2010, which bars American manufacturers from buying natural resources extracted in territory controlled by organized crime or terrorists. Experts believe the global spot market is where illicit coltan from Venezuela and Colombia may be destined. They’re concerned the illicit trade in South America will grow and mimic the business in Congo, where coltan profits have helped sustain factional violence. Government research on smuggled minerals in the two countries is limited, but some police and military reports reviewed by ICIJ show that authorities have confiscated about 190,000 pounds of coltan since 2009 — some of it taken without proper permits even before Chávez outlawed all coltan private mining. This scale of mining is essential to a black market. In places like the town of Parguaza, on the banks of the Orinoco River in southern Venezuela, there’s a buzz about coltan — and plenty of buyers. Residents said that in mid-2010, after Chávez outlawed private mining, a group of businessmen arrived and promised that jobs and houses would follow if they signed petitions to the federal government in support of legitimate coltan extraction. The government ignored the petition and the businessmen never came back, said Flandes, a Parguaza miner who didn’t want his full name used, fearing reprisals from authorities and smugglers. But buyers still arrive in search of coltan. Local land owners told ICIJ that mineral brokers have come from neighboring Colombia and far-off Australia and South Korea. Despite the traffic, Amazon miners remain wary of outsiders. After several requests a group eventually met with ICIJ in Parguaza. They offered only single names like Flandes, Efraín, Ramón and Camilo. They described a difficult but potentially rewarding life in coltan mines. Their claims are far from roadways and roving military patrols. Walking is the only way in, so once they’re sure no one is watching, they pack their picks and take to hidden trails. Because of coltan’s growing popularity, Venezuelan miners said they no longer have to tote heavy bags of ore along clandestine trails into Colombian territory. Now the Colombian buyers cross into Venezuelan territory and haul off the minerals. “Colombians are the ones who move this stone here. They are the ones who are taking it and giving life to the business,” Flandes said. “As cars don´t enter in this region, [buyers] come with motorbikes and then go to the port of El Burro, where they take a motorboat that leaves them in Puerto Carreño,” just a 15-minute trip across the Orinoco River from Venezuela. Like generations of small-scale miners in this region, Flandes once hunted for gold and diamonds. Now he’s interested in coltan because it’s easier to find and earns him good money. Coltan in Venezuela’s Amazon jungle is often found in small rocks close to the surface. A coltan plot might yield other minerals like tin or titanium ore — also wanted by high-tech manufacturers — so a new mine attracts dozens of would-be prospectors. One lucky miner said he found a coltan-filled rock, weighing almost seven pounds, which fetched $23. That’s good money in remote Venezuela, but prices can go up to about $55 a pound as coltan reaches manufacturers, according to the Venezuelan Ministry of Basic Industries and Mining. Another miner, Camilo, remembered that soldiers recently arrested two women and some children who were working a claim. “They took the minerals from them,” he said, adding that the women and kids didn’t know what experienced miners have learned: splitting coltan loads with soldiers is a good way to avoid being jailed. Locals — including church leaders and area government officials — quietly complained of military involvement in smuggling. Few reports have been pursued, however, as people whisper that it’s unsafe to accuse an officer. In 2009, the Foundation for Science and Technology Development in Amazonas State investigated rumors of Colombian smugglers moving Venezuelan coltan. This followed the government’s first acknowledgement that the ore had become cross-border contraband: coltan traces and mining equipment were found on an isolated farm in Bolívar state. In September, 2009, another 54 tons of ore containing an unspecified amount of coltan were confiscated from a Colombian citizen. Since then, local leaders said, children have been found working at family-run mines in Venezuela and Colombia, with little attention to safety. Miners said they accept the risks because coltan is one of the few work options in this poor region. 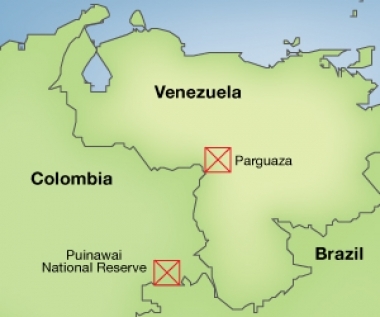 Venezuela’s Amazonas state, roughly three-quarters the size of the United Kingdom, is home to 144 thousand of the country’s almost 30 million people. In the region’s huge rural tracts, the only real private-sector work is subsistence farming or fishing. The territory is hard to get to and difficult for outsiders to navigate; well-suited to multinational smuggling, especially along the 1,350-mile Orinoco River which marks part of the border between Venezuela and Colombia. One suspected destination for coltan is Brazil, the second-largest exporter of the metal. It’s also home to a number of smelters that process ore imported from around the world. Brazilian mining law experts have urged politicians and the country’s growing high-tech manufacturing business to tighten controls on mining. They said inadequate, outdated laws have allowed a black market to grow in the country’s northern Amazonian provinces. “Legislation is the same as 40 years ago,” said Sergio Rocha Brito Marques, a lawyer who reviewed Brazil’s coltan trade for ICIJ. The result is mining chaos near Brazil’s borders with Colombia and Venezuela — where prospectors have no clues on global prices for ore and buyers don’t demand proof of origin for coltan. Despite Venezuela’s crackdown, willing coltan traders — some of them Colombian — have been found on Internet sites that offer buyers and sellers private space to negotiate deals. “Clients can interact directly with every major global exchange while maintaining control of their order flow in a conflict-free, anonymous environment,” the firm says on its pages at tradeboss.com. The company promised quick delivery. But there’s little physical evidence of Korea TPC in Venezuela. The company lists offices and phone numbers in an upscale hotel and apartment building in Caracas. Yet visits to the addresses yielded shrugs from residents who said they knew nothing about the company. After ICIJ began inquiring about Korea TPC’s interest in Venezuelan mining, its website went silent. Business registration documents list Moisés Gonzalez as Korea TPC’s Venezuelan partner, but ICIJ could not find him, although he is listed as the target of civil actions claiming he did not deliver on lease payments for office space. In a drab office in an industrial park south of Seoul, Korea TPC President Ha-Young Yang told ICIJ he’d given up on the Venezuelan coltan business in 2010 because supply deals with his Caracas contact never materialized. Yang said he was misled by Gonzalez. Other Internet sites such as Alibaba.com and tradetag.com offer coltan for sale and list offices in Venezuela. But those offices do not appear in Venezuelan commercial registries. One company, Florida-based Global Impact USA, lists Aribel Ojeda as its Venezuelan contact, with a contact phone number that’s also listed for another online coltan broker, Hawk Enterprises. A person who answered a call to that phone refused to talk about the Venezuelan coltan business. Global Impact did not return calls seeking comment. The opaque marketplace for Venezuelan coltan is a symptom of a problem that the Chávez government must resolve, said researcher Raimund Bleischwitz, of Germany’s Wuppertal Institute for Climate, Environment and Energy. The consequence of inaction is a black market that will grow more dangerous and unmanageable.